Both my father and paternal grandfather fought in the Great War; my grandfather making the ultimate sacrifice. His is one of the names on the War Memorial in Old Steine and I regularly attended the services on Remembrance Day with my father. At the age of 21 he found himself responsible, with his widowed mother, for his two brothers and two sisters. These memorial services were, understandably, much larger events in the years after the Second World War and they were incredibly moving. All the bustle of life for the living ceased absolutely for two minutes. For those who had died it was just two minutes of eternal silence. It is to the credit of the town that the upkeep of the memorial has been improved in recent years. Perhaps what I find most satisfying is that the town’s dead are remembered here in the very heart of our beautiful city, surrounded by familiar haunts. 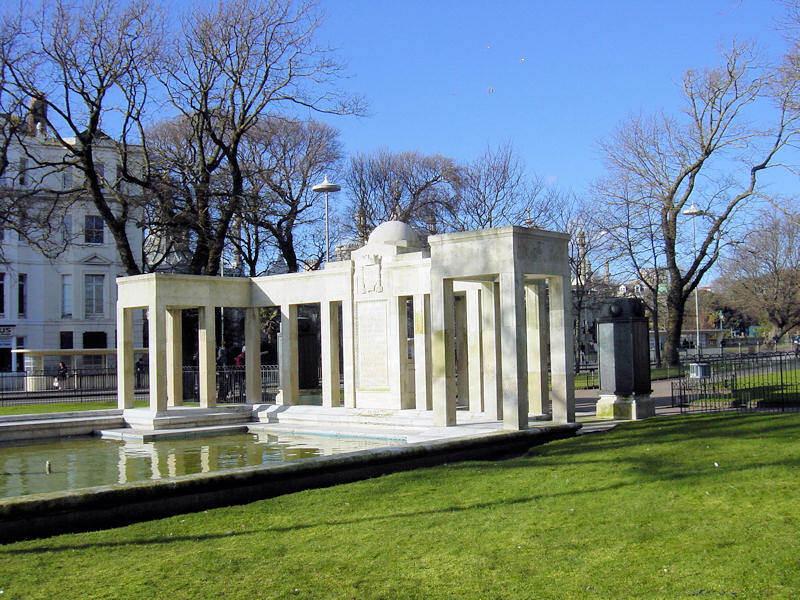 Sadly, they were never to see again the Old Steine garden and fountain itself, the Palace Pier (as it was then), the Pavilion, The Aquarium (Sea Life Centre today), Castle Square and The Lanes. My late husband Michael’s grandfather is named on here. John Charles Tonks. I forgot to add my ancestors names: Henry Offen, Abraham Offen, Frank Offen. My father’s Great Uncle is commemorated one of the obelisks at this wonderful War Memorial. His name was LEONARD GEORGE HUDSON. Portsmouth born but he was married in the now demolished St. Saviours Church and lived in Brighton prior to his recall to the colours. He is buried in Artillery Wood Cemetery, Belgium having been killed in action during the battle of Paschendaele. The photograph of the Memorial shown above manages to capture it beautifully. It really is a credit to Brighton and those named upon it. May this degree of maintainance continue. I am trying to find out if my great uncle is named on this memorial. Is there somewhere I can find a list of the people’s names? St Peter’s Church in Brighton, have a full list of names; they are not on display you need to arrange a visit. If you go to Google and key in Names on Brighton War Memorial’, there is further info – hope this helps.